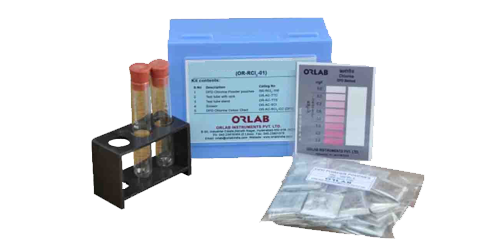 Ammonia as NH3 - N Test Kit - Orlab Instruments Pvt. Ltd.
Procedure: Small amount of sample is collected in a test tube and the corresponding reagent is added to the sample. Color of the sample changes and the same is compared with the respective color chart. The reading of the matched color on the color chart is the concentration of the respective parameter in the water. Ammonia Produces a yellow colored Compound when reacted with alkaline nessler reagent, which is proportional to the ammonia concentration. 20 ml Ammonia reagent -1. 20 ml ammonia reagent -2, Ammonia color chart,10 ml test tubes with cork -2 Nos, Test tube stand, instruction manual in a flute board box.